Audra Mulkern is the Seattle-based founder of “The Female Farmer Project,” a photographic and story-centric chronicle that bears witness to the rise of women in agriculture. In 2012, she stood in the middle of a farmers’ market and had an epiphany. She saw women everywhere—growing food, raising livestock, making cheese. They were stewarding a vibrant local economy. The visibility of these female farmers made her question the gender stereotypes inherent in agriculture, and prompted her to dig deeper. 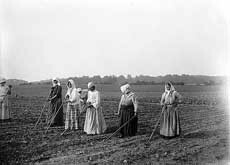 Join Audra as she discovers the women throughout history that have been the hands keeping America fed, clothed, and sheltered. Their stories of determination and grit have gone untold — until now. Please indicate Women’s Work:The Untold Story of America’s Female Farmers in the memo line.